You can search kanji characters through the reading of kanji, the approximate strokes or the component parts. You can input search criteria by the software keyboard as well as Auxiliary Pallet. † In the following directions, the letter "n" and "m" represent number. † When you input the multiple search criteria, please input the space character among the criteria. If you input multiple parts as the search criteria, you can omit space characters among parts. † Super Kanji Search searches the variant characters of your selected parts at the same time. For example, if the part "豊" is selected, Super Kanji Search searches the kanji characters with "豐", the variant character of "豊". To search kanji characters with your selected/inputted kanji as the component parts. To refine the search by reading. To search kanji characters with Katakana-like component parts. To refine the search by Romaji as reading, when you select "Enabled" at "Romanized search" setting. ※ To describe the reading "ん", input "n". To search only kanji characters matching the specified criteria. To search kanji characters with the component parts, while the component parts of 〈Kanji 2〉are deleted from the counterparts of 〈Kanji 1〉. † You can use the Japanese prolonged sound mark "ー", instead of "－". To search kanji characters with n pieces of 〈Kanji〉as the component part. You can also input "〈Kanji〉×n" or "〈Kanji〉*n" by keyboard. To search kanji characters with n strokes' component part. To refine search kanji characters with n strokes as the total number of strokes. To refine search kanji characters, while the total number of strokes is n strokes or more, and n+m strokes or less. To refine search kanji characters, while the total number of strokes is n-m strokes or more, and n strokes or less. 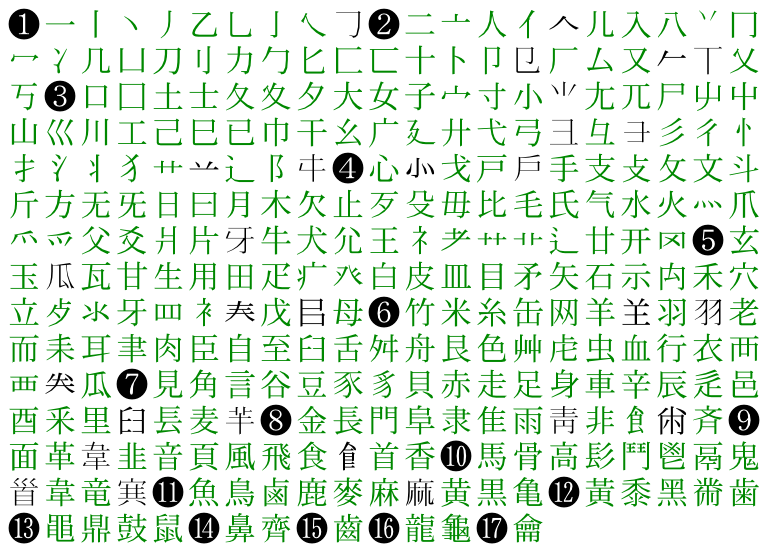 To refine search kanji characters, while the total number of strokes is n-m strokes or more, and n+m strokes or less. To refine search kanji characters, while the total number of strokes is n strokes or more, and m strokes or less. † Please note that there is a difference between "n" and "=n". To search kanji characters with n strokes' component part, use "n". 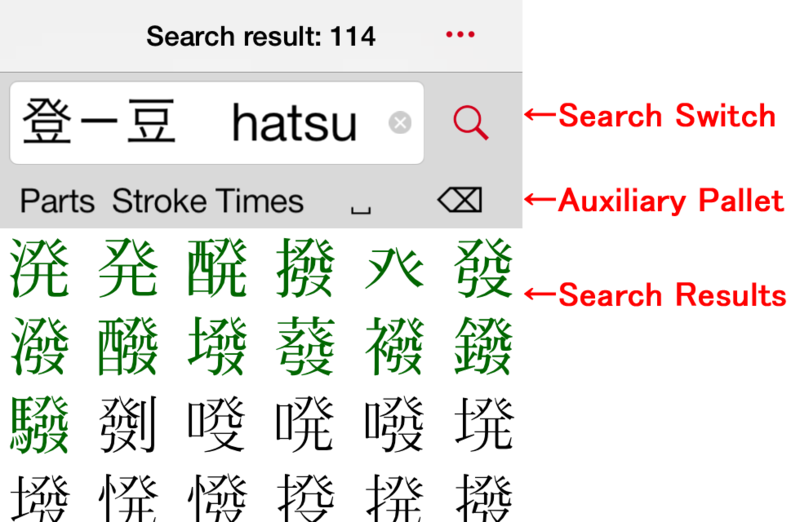 To refine search kanji characters with n strokes as the total number of strokes, use "=n"
In addition to the classification of parts in Kouki jiten and general kanwa dictionaries, frequently-used kanji and parts for the search criteria are listed in strokes' order. You can select and input the symbol for Refine Search by Strokes. You can select and input the condition, from "×2" to "×9" for Multiplication Search. You can input the space character for separating the multiple search criteria. You can delete the search key just before the cursor (pointer) one by one.